* Feature support depends on the cellular phone software. See manual for details. ** Sold separately. Without an adapter additional labor may be required or a separate speaker may have to be used. Adapters for some car models are not available. Bluetooth® is a new wireless technology that enables connectivity between two or more devices (for example, cell phone and vehicle) by utilizing a 2.4-GHz radio that has a range of 10 meters. Bluetooth® allows customers to use their compatible cell phones hands-free in the vehicle. Intended to replace the cables connecting portable and/or fixed devices while maintaining high levels of security. The key features of Bluetooth® technology are robustness, low power and low cost to connect and communicate with each other. 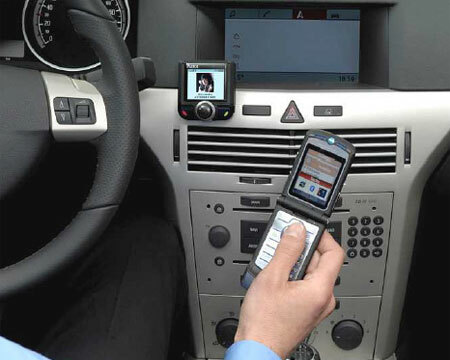 The vehicle Bluetooth® system can pick up the Bluetooth® signal from the handset up to 30 feet from the vehicle. The range is largely dependent on which phone is being used and the battery level of the phone. There are no apparent wires. Once installed, just turn on the engine and you are immediately connected to your phone. Even by leaving the mobile phone in his bag, or purse with this Bluetooth® kit the driver dictates a name and is immediately connected to his correspondent. The car's speakers transmit the conversation with perfect quality of sound, regardless of the driving conditions (traffic, highway…).